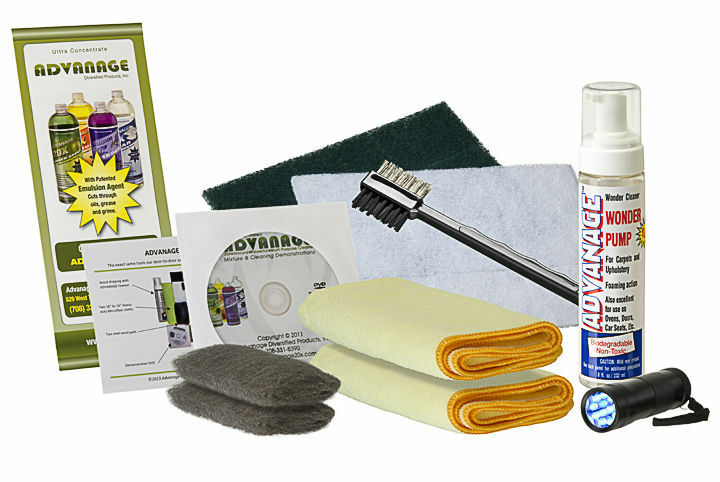 With this kit you'll be ready to tackle any cleaning job. Includes two 16” by 16” 300 GSM heavy-duty Microfiber Cloths; White (non-abrasive) and Green (abrasive) Scrounges; one Combination Brush with both nylon and steel bristles, Steel-Wool Pads, one Foamer Pump to avoid dripping when cleaning vertical surfaces. Includes demonstration DVD which shows you exactly how to clean just about anything. Also Included is our Ultraviolet Black Light to uncover stains and spots you never knew existed.